Celebrate Graduation with Just-A-Scrappin' Use school colors or anything goes and add some bling. I have TWO graduations this year. One, Tara, from law school, takes board exams later this summer. The other, David, from Iowa State with school colors of red and gold. 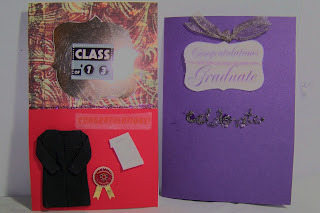 First card is for Tara in purple because I love purple and have no idea if law school has colors. I used <rctngle8> at 2 1/2 inches from Art Philosophy Cricut cartridge, added the label, glued to card. Added the sliver ribbon with Dots and the metal with glitter glue. Inside will say " When you pass your bar, your be as happy as a bird with a french fry". The other is Red and Gold, the gold always reflected the light not the flash. I used red card stock for the bottom half and a PP for the top. Cut <Square3> at 3 inches from gold card stock using Art Philosophy Cricut cartridge. Finished with stickers. Inside is a small envelope with play money sticking out. Everything I used came from my stash. Come on and join us at Just-A-Scrappin'!